⭐️A natural deodorant that cuts the BO and the BS (Baking Soda :) I use a very mild, synergistic, formula, where each ingredient works together, rather than a reliance on baking soda. ⭐️A natural deodorant that works, doesn't irritate your armpits, smells great, and lasts all day! 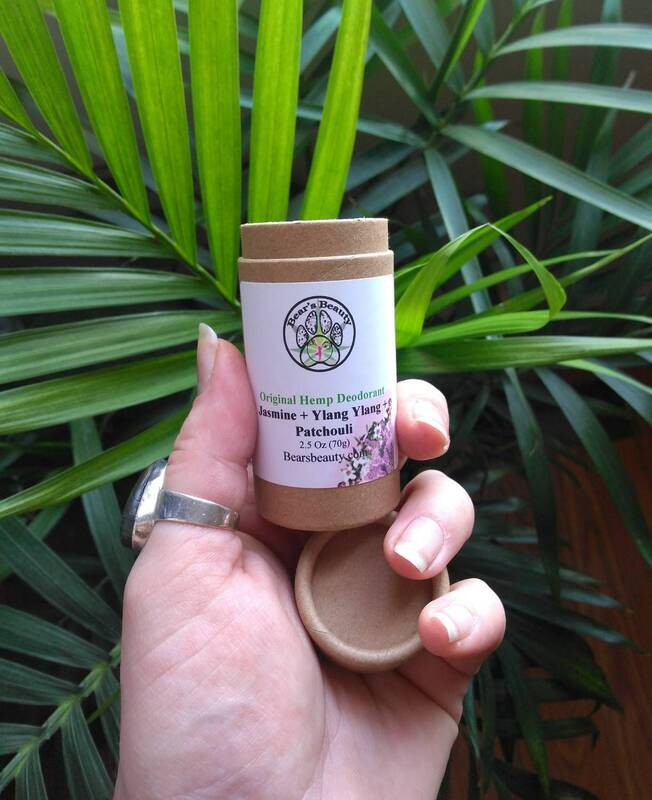 ⭐️Natural + Organic + Vegan Deodorant Stick in several essential oil scents, including unscented. ⭐️Prevents Odor + Smells Great + Allows Natural Detoxification Process of the Body to Resume. Great for tweens + teens + all ages! More than anything, this stick is essentially as much Organic content as possible, excluding Minerals, as they cannot be certified. As the Natural Deodorant market grows and new brands launch, I am shocked at the green-washing. Brands calling petroleum-based deodorant "natural." I mean, poison ivy in "natural.' 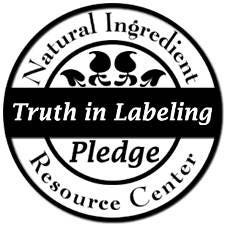 I am just saying, check your ingredient deck. Original uses a combination of baking soda + clay + starch + essential oils to keep you smelling fresh. A few years back I was working a crappy salon job and trying to transition to natural beauty products. I also lived in a house with no AC. Necessity breeds invention, and SEVERAL tries later, Bear's Beauty Deodorant was born. I have super sensitive skin, so my formulas are made to be gentle. No matter what you are currently using, you don't need to worry about being stinky while you transition. I do not skimp on quality. I use Organic and Food-Grade ingredients, down to the clay and Essential Oils. I also only use Essential Oils and Absolutes to scent my creations, no fragrance oils to wreak havoc on your hormones. 5. Currently use CLINICAL = Max Strength (8-12), and can be combined with Probiotic Cream and Deodorant Body Powder for added protection. 6. ACTIVE + HOT YOGA + Hiking + Camping = Start with ORIGINAL or CLEAR, if this is not enough protection, get Max Strength your next stick. The Max has added baking soda and magnesium. ❤️Formulated for the most sensitive skin, but truly effective. Lasts all day, because I believe that being natural is NOT enough, you deserve products that are easy to integrate into your daily life as well as effective! ❤️Check out this blog for info on choosing the right formula for you! ✨Minerals stop you from smelling + absorb excess moisture will make your transition from commercial to natural 100% smooth. ✨Carefully formulated to be balanced + effective + gentle. ✨Bear's Beauty Natural Deodorant is different from others on the market because it is truly effective + has a several year proven track record of being effective + lasts all day without need to reapply + is made with a focus on skin care. ✨Aluminum in commercial Antiperspirant is being researched as being linked to cancer + Alzheimer's. If you are like me, this is just not something you want to risk. Talc, Tricolsan, and Parabens are just a few other toxic chemicals found in commercial antiperspirant. ✨Your body is meant to sweat. It is how you shed toxins and regulate your internal temperature. Your lymphatic system is in charge of moving fluid throughout your body. You have lymph-nodes throughout your body; your armpits and throat being two of the closest to the surface of the skin. ✨Commercial deodorant plugs the pores under your armpits with Aluminum, blocking them from sweating. This, in my experience, causes the body to sweat even more. If you have ever had a deodorant work for three months and then just stop, you know what I am talking about. Your body is perfect, and made to regulate itself. Like they say in the movie with the dinosaurs, "Nature will find a way." ✨Rather than fighting a battle with sweat and against your own body, my deodorant allows your body to sweat, without letting you stink. ⭐️The science is in the sweat itself. Sweat does not actually smell, but the bacteria living on your skin flourish in a damp environment like your pits, left unchecked. ⭐️Organic Hemp Seed Oil : Packed with omega fatty acids that provide skin with building blocks for healthy cells. It also happens to be anti-inflammatory, helping with everything from Keratosis Pilaris to Eczema and dry skin. Considered a ”dry" oil, it quickly absorbs into the deepest layers of skin. Rich in Linoleic Acid, it helps keep sebum from becoming thick and actually helps unclog pores. Provides your cells with just what they need to be healthy + minerals + chlorophyll. It helps to keep sebum from becoming thick and unclogs clogged pores. It has amazing benefits for discoloration + dryness + redness + acne + wrinkles. ⭐️Organic Arrowroot Starch : Once used in the Amazon to absorb toxins from poison arrows. This starch, very similar to potato helps to absorb excess moisture and leaves skin smooth. This formula is never crumbly or dry, but a smooth as silk balm. ⭐️Naturally Sourced Baking Soda : Helps reduce unpleasant odor by preventing bacterial growth. ⭐️Essential Oils make you smell great. ⭐️Vegan Candelilla Wax : Unlike beeswax, is a totally vegan option for making this formula a stick. It also helps keep formulas on your skin longer than all oil-based products. Apply a thin layer to underarms + massage excess into skin. Wait at least an hour after shaving. 👉👉 MEN : Apply in downward strokes to keep from tugging your armpit hair. ❄️ Winter - if you find your stick is a bit solid in cold weather, hold against your skin for a few seconds to warm and soften. 🌟This is not the commercial deodorant that you are used to. Do not apply a thick layer, this will only rub off on your clothes. If you find you need more protection, try a stronger formula (Original, Extra Strength, or Max Strength) OR pair with the Deodorant Body Powder. Less is more. Apply a thin layer and rub in any excess. If you are having issues with staining, please try applying less product. 🌟 Will there be a detox period? - Maybe, but in most cases it is a mild irritation for a few days. 🌟 Will I sweat? - Yes. your body is meant to sweat, as a means of detox. You may find that you sweat more for a few weeks, but you will eventually balance out and sweat less. 🌟 Is this safe for children? - I suggest using the Sensitive or Probiotic Cream formula on ages 8+, but always consult your doctor. 🌟 Can I apply this after shaving? - No, wait at least half an hour, but ideally 1-2 hours. 🌟 Make sure you exfoliate often and clean your armpits before re-applying. 💚After purchasing Bears Beauty deodorant, I am a lifelong customer now! Hands down, absolutely the BEST deodorant I have ever used. I am a 911 dispatcher and deal with stress sweat all the time on my shifts. 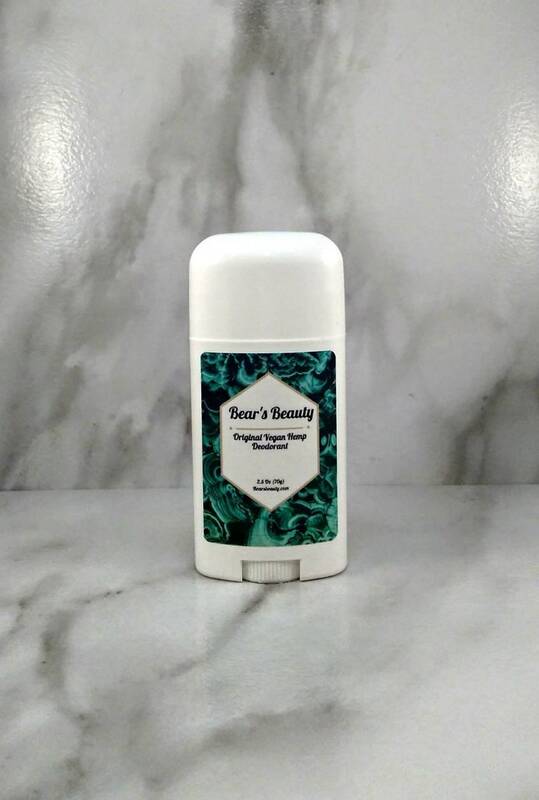 Bears Beauty deodorant smells amazing all day long and with no trace of body odor! I have been using natural, aluminum-free deodorants for over 10 years and this product towers over any other product I have ever used. Like I mentioned before, I'm now a customer for life! 💚Great product that works well and prevents odor and smells great! Shipped quickly and arrived in great condition. My favorite deodorant hands down!- Elyse M.
💚Ordered this deodorant for a friend because she absolutely loved the sample of it! She said that it combated odor very well and kept her smelling fresh all day. 💚The shipping was very timely and the quality of the product is amazing! I feel that with use my underarms have become softer. It feels so good to use a product that not only works but at the same time I know is not harming me. 💚I've tried a lot of natural deodorants, and this is by far the best I've used. 💚I couldn't be happier with my purchases. I ordered three deodorants, a toothpaste, and hemp balm. Firstly, I've ordered natural deodorant from other shops and while they worked, they were thick and took forever to apply and in order to get it on I had to kind of scrub it on -- which left me with angry red pits. 💚Her deodorant is so SMOOTH. it glides on and smells DELICIOUS. the other deodorants I ordered from other shops smelled really strongly of nothing. Mine smelled perfectly of citrus vanilla-- very fragrant and feminine and not overpowering and heavy in the least. Seriously, it's like delicious butter. LOVE IT. I ordered a small hemp oil and because it arrived a day late, she upgraded it without being asked and without me complaining. Plus she included a lime Shea butter sample--also awesome! Great lady, great product! !